God created all men equal. We are all one, and so we deserve to be. It is a matter of great regret that in certain remote corners of the globe, worlds prevail of dark, miserable obscurity, worlds of deprivation and tears and scores of unfulfilled desires of people, who are, in no way, inferior to us. One of NDA’s greatest initiatives, Julie School, is a ray of hope for those underprivileged children who deserve to be one of us. Started with minimal resources, it has today grown to a larger school with students attached to the main branch of Notre Dame Academy. Moral Values are always stressed. The children are taught English, Hindi, Mathematics, Science, and Social Science, besides G.K. in the higher classes. The Sisters and the students of Notre Dame also provide them with clothes, stationery, and food items, which can enable them to lead healthy, happy lives. 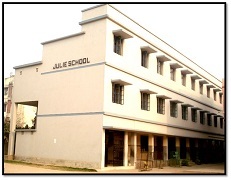 Julie School celebrates Sports Days, Teacher’s days, Children’s Days, and organizes cultural activities to help children tap their hidden potential. The students are also awarded perfect attendance and excellence in academics and other spheres. Under the able guidance of their headmistress, Sr. Mary Mallika, there is a consistent effort to improve life for these children and quicken the process of their integration into the mainstream of the society. In fact, after finishing Std. VII, many are absorbed in well- recognised high schools in Patna.